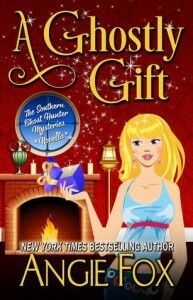 A short and sweet read, A Ghostly Gift has a touch of humor, a sleazy ghost bar, and a heartwarming tale that will hit you right in the feels. After reading the 4th book in this fantastic series, I vowed to catch up with all the other books. A Ghostly Gift is a very short story (it took me a half hour to read) set just after the first book. Verity's sister, Melody asks her for a favor; a friend's resale shop is being terrorized by a ghost and she needs Verity's help to get rid of the ghost before anything valuable is broken. With gangster ghost Frankie by her side, Verity goes to investigate and uncovers a long lost secret: a dead WWII soldier needs help to find his old sweetheart. This was heartwarming and a little sad; my heart went out to the poor soldier and his lost love, who have spent decades mourning their lost love. When they were eventually reunited, it made me a little teary. I'm a sucker for this kind of thing. Overall, an excellent short story in a fantastic series, and highly recommended for paranormal mystery fans.